Jonah (Arabic Younaan) is one of the prophets of the Old Testament. Scholars believe that he prophecied during the time of Yarbaam II (931-910 B.C.). His name in Hebrew means a dove. He was chosen by God to travel to a pagan city, Nineveh the Capital of Ashur “Assyria” the biggest enemy of Israel at the time. Nineveh was in the North east of present day IRAQ. His mission was to preach repentance: “Now the word of the LORD came unto Jonah the son of Amittai, saying, Arise, go to Nineveh, that great city, and cry against it; for their wickedness is come up before me.” (Jonah 1:1,2). Assyrians were pagan and worshipped many gods including the god “ashur” the god of power. 3. From his reasoning with God that he thought that god will accept their repentance and forgive them. Jonah the human considered it not fair for god to accept the repentance of these heathen, no god people! All the reasoning of Jonah was correct, but although he was a prophet, he misunderstood the ways of the Lord, God, Creator of heaven and earth. God definitely accepts repentance when it is from a contrite (repenting) heart. 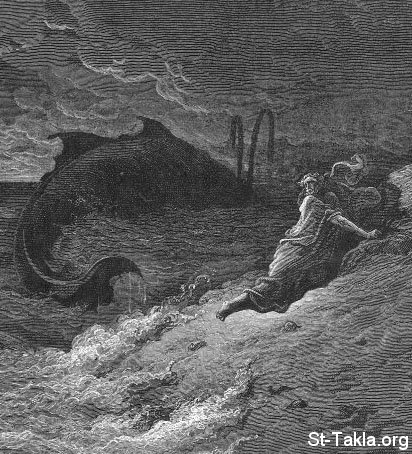 Even pagans deserve God’s mercy, and Jonah could not escape from the face of God no matter where he goes, or what he does. As the scriptures explain, Jonah went into a deep sleep (something you and I might have done before to escape our problems), while the ship was carried up, down, and sideways by the wind which God caused to blow. The pagan mariners (ship crew), and passengers, since this was an Old Testament event, were all praying to their pagan gods, but Jonah was deep asleep in the lower deck so not to be bothered, a reminder of Adam’s escape from the face of God after he sinned. The mariners still did no want to do what he asked, for fear of God even though they were pagan. But, at his insistence they threw him into the sea. The whale(animal) helped execute God’s plan and Jonah had no choice but to obey to completion. Our blessed Coptic Orthodox Church gives us the blessings of three days in February to fast on the example of the people of Nineveh. This particular fast was added to the schedule of fasts of the Copts by Pope Abraam Ibn Zaraa who was of a Syrian origin, was a God fearing merchant who was respected by the community and elevated to the Chair of St. Mark as Pope and Patriarch (62nd) (967-970 AD). The Miracle of moving the Mukataam Mountain happened during his patriarchate. He also documented the Coptic System of dating Church events, called “hessab el-apakty” (The Calculus of remainders). May we take advantage of this fast to cleanse our hearts from every evil thought and come to the knowledge of the truth. Glory Always be to the Father, and the Son, and the Holy Spirit. One God. Amen. The blessings of the Prophet Jonah and the Fast of Jonah (Nineveh) be with you always.